The Four Desires is the inspiring, empowering and life-changing process, based on these ancient, time-tested teachings that Rod created for anyone seeking a better, more fulfilled life. The Four Desires will unleash your vision and power to thrive, show you how to tap into the power of your soul and guide you to become who you were meant to be, the place where worldly and spiritual prosperity meet. 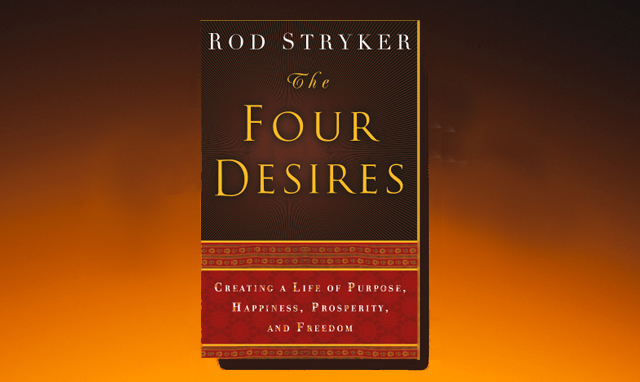 First developed as a live event, which Rod continues to teach throughout the year, it is also a best-selling book: The Four Desires: Creating A Life of Purpose, Happiness, Prosperity and Freedom. Companions to the book include The Four Desires Workbook and The Four Desires Practice CD-Set. Click on the video to your right to hear a section of Rod’s Four Desires talk at the Aspen Ideas Festival. This is a process for anyone––whether you have never done yoga or you’re an expert­­­­––wanting a better, richer, more meaningful life. To learn about upcoming Four Desires Weekends click here. To purchase the book, workbook or 2-CD practice set click here. To purchase the e-book version of The Four Desires, click here. To purchase the e-book version of The Four Desires Workbook, click here.